Striking a conversation in your office circle and breaking bread with the people you discuss-pie charts and bar-graphs with is not the same thing. Chit-chatting at the college canteen or in an online chat room is always much simpler. It takes skillfulness and general knowledge to open one’s mouth and reveal their tact and wisdom while communicating or making long conversation between two strangers. People who fail to strike the right conversation with strangers or how to start a conversation with new clients in business never succeed in their career. There are many individuals who take special training to enhance their communication skills. 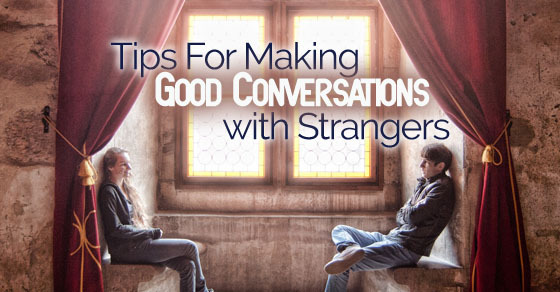 The following mentioned are a few tips on how to mingle with strangers. To have a conversation with a stranger in English you need not be an Einstein to understand this simple fact about communicating. Good communications happens only if you are polite and soft spoken. Loud and rude conversations never yield the right results. Talk with courtesy and maintain a good body language. Very often there could be heated arguments on certain topics. You may be excited to present your views but be careful not to hurt anyone’s emotions. If you have strong views against or for it, you need to take pains and phrase the statement in a polite and soft spoken manner. If you think a heated conversation could possibly arise, try and avoid such conversations. Be intelligent to make good conversations that do not affect others emotions. This is one of the best conversation tip. Manners count a lot while you are making conversations which are professional . Interrupting someone mid-sentence may work in an informal circle . But no one likes being interrupted when they are putting their thoughts across. Train yourself to behave well in professional circles. Any speaker expects that his listener is paying attention to what he says. This is the basic respect you must give him. If you have queries or doubts regarding the subject, ask your queries after he concludes his speech. This way, he won’t have a bad impression about you. Professional life is way different from your personal life or relations with your friends. When you are with your friends, you can afford to be a bit weird or geeky. That is not the same in professional circles. When you are in the midst of your colleagues and workmates, you should have control on your expressions. Surely, that one topic thread got way out of control and everyone at the table had a hearty laugh at the banter. Yet, if you go beyond a few sniggers and shakes of the head, it might draw a few stares from your colleagues or anyone else in your circle. No matter how good the joke was, this is one circle where you cannot afford to thump the table. Learn to control your laughter. Not all conversations are meant for you at the new office. Starting a long conversation between two strangers is not possible, even though he/she is your colleague. Some are private conversations while some might be even confidential. So please do not invite yourself starting a long conversation where you are not expected to open your mouth. Usually, it begins awkwardly, and ends twice as much awkward! You may come across many office related topics in the canteen or while with your friends. These could be confidential and controversial topics. You may hear them out but make sure never to speak about them with your seniors. Speaking about such topics may affect your reputation. Jealous colleagues can misuse such occasions to create a negative impression about you. You need to hold your tongue when you are in professional circles.This is one circle where you simply cannot win the audience with a politically incorrect joke. Cracking a sexist or chauvinistic or racial piece of humor is not the way to break the ice in these circles. One key to making professional chat with strangers in the business is to present the facts without being offensive. Pointing out the negatives without a basis can ruin a professional relation for a lifetime. Strangers in business are often would be clients and you should possess the tact to speak to them intelligently. Curtness may not be the best way to foster a personal relation but professional relations are way different. Most of us are aware that uttering the wrong phrase at these get-togethers or meetings with new clients could damage your reputation. But few take notice of the fact that running your mouth and blabbering more than what is required can harm your reputation equally. So be curt and charming. It raises the benchmark for the conversation they have with others. People in your professional circles may just gain inspiration from you and control their tongue. Curtness in professional circles makes you a mature individual in the trade. If you speak excessively, your colleagues may fail to notice the important things you speak. You maybe out there to meet a new client and build a new business relation. You may sure have the temptation to exaggerate or speak some additional positive traits about the firm or organization that isn’t actually true. In such instances, do not lie. It takes skill to bluff and it takes a skilled bluff-master to bluff when other bluffers are present in the vicinity. So be careful about what you put out their because it might backfire if you cannot back up your facts by answering the questions that pop up as a result. Since it is your first meeting, he may even classify you as a lair if you lie to him in the very first meeting. A long conversation between two strangers should not start like an advice. There are many who love giving free advice to people around them. This habit may work well in personal circles but in professional circles and especially with a stranger, it is a big no! Sure you have some good points and they may make sense but that does not mean you have to give an hour-long speech. Any conversation gets one-sided when you start giving long and lousy speeches. It stays interesting only when both get equal opportunity to speak. In professional circles, no one has time to waste. So, it is best to avoid speeches. Any conversation with a stranger in English will be complete and effective only if you speak as well as listen. You must remember that every conversation in professional circles is important. You may have a meeting with the client for the first time or you may be conversing to a newly appointed junior in your team. If you ignore what they speak, someday you will be answerable for not jotting down the facts. It is not always about putting yourself out there. When you talk, you discuss things that you know. When you pipe down and listen, you learn something new. So, it pays to not always be the speaker. A conversation is as much about listening as it is about talking. In personal relations, two people sharing a house cannot stay without speaking to each other for long long. It may be regarded odd or weird. This is not the case in professional relationships. If you are one of those who start a conversation for the sake of starting a conversation, you probably suffer from social anxiety. It does not tip the odds in your favour. So you must know to keep mum when there is really nothing to speak. This is a best way to start a conversation. To understand the politics of work relationships and deal with people accordingly, a long conversation between two strangers at the office will be considered effective. Speak only when asked to, but speak wise. Just because you have the floor does not mean you can prattle on about anything under the sky. When people respect enough to lend you their ears, do justice to it by discussing something constructive and productive. You should also keep in mind whom you are speaking to and phrase your conversation accordingly. If you are speaking to a subordinate, you must speak something that adds to his knowledge. His respect for you should grow with each conversation. On the contrary, if you are speaking to a new client, initiate conversation that emphasizes on the project you are dealing. If the client is unsure about his decision, your words may help him make a decision. He may be trying to gauge whether you possess the right knowledge and experience to deal with such a project. Help him decide sooner by scripting your conversation right. Be well dressed when you are in professional circles. Formal attire and formal shoes are a must. Use deodorant or spray to get rid of body odour. Do not scratch your head in the midst of the conversation. Maintain an erect posture during the conversation. Carry your hand kerchief while heading for professional meetings. Maintain a steady tone while conversing.